We continue to be impressed and rewarded by the impacts of our exercise on the issues of people and performance in the workplace. 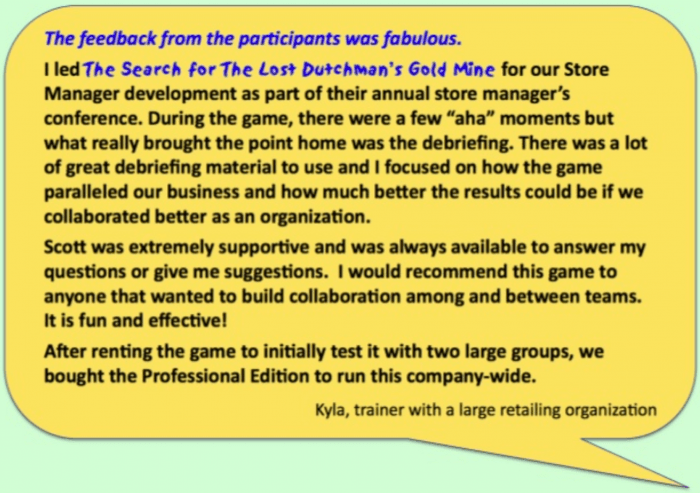 As more and more users experience this teambuilding exercise, it continues to confirm that the intended messages from our business simulation are being received and that participants become more aware of the available choices the have for motivating their people. 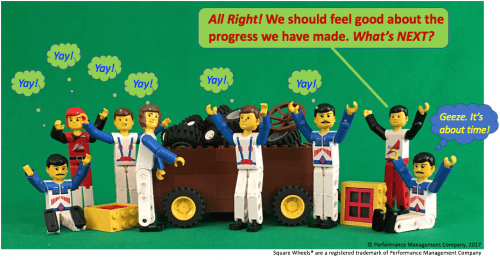 Involving and engaging managers in ideas for workplace improvement is an essential part of any leadership development program and Lost Dutchman does a great job at generating more openness to the issues and opportunities around collaboration. Competition is the norm in so many workplaces and this exercise opens up communications about what can be done differently to impact performance. 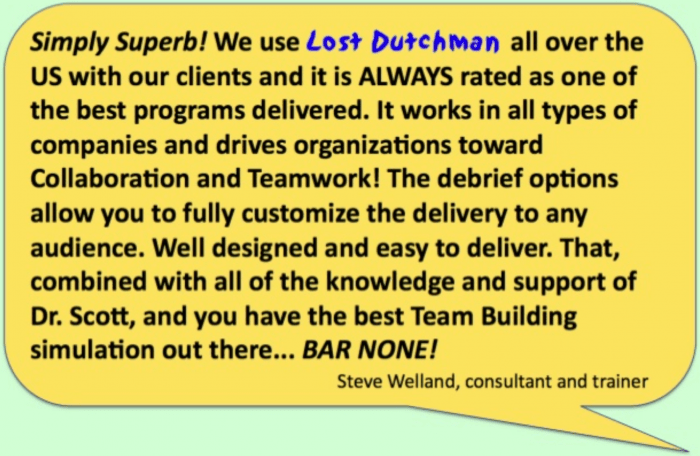 Dutchman is unusual as a teambuilding exercise because so much about the exercise is measurable. People can make choices which optimize overall results and the impacts of choosing to compete or win demonstrates the downside when viewed overall. And if you have any questions at all, we would love your comments. Okay, March 12 is a Monday.And you can choose to do a bit of Disruptive Engagement if you choose. 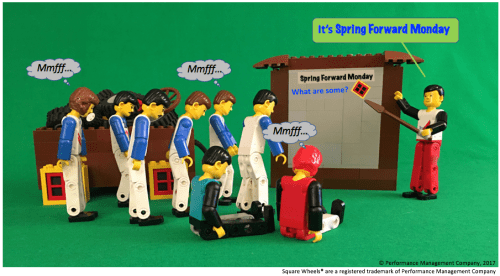 March 12 is also the Monday after Sunday morning’s loss of an hour’s sleep as we set the clocks ahead each Spring. zzzzzzzzzzzz…. AND, it will be one of the low productivity workdays — it is also called Sleepy Monday based on research — and you know people will be dragging. So, with most people dragging, and with this a known problem, why not choose to do something differently? Why not recharge their batteries and increase involvement and low motivation and teamwork (sometimes not really good anyway) by facilitating a meeting focused on their issues and their ideas for improvement? Choose to be a Draggin’ Slayer. Seize The Day! 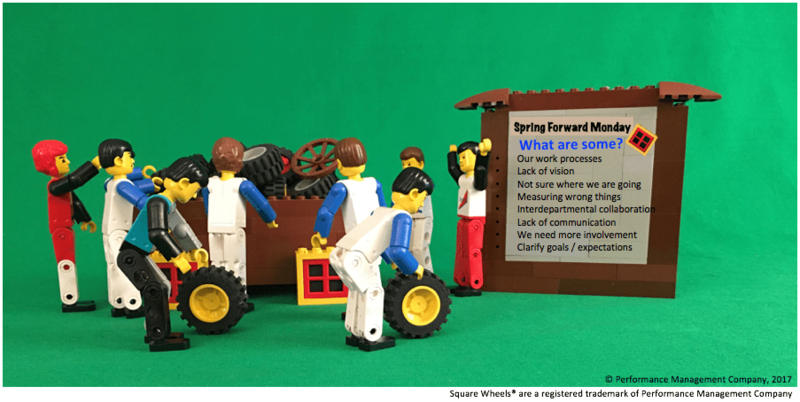 Our experiences show the dragging can be short-lived as people get involved with the Square Wheels® metaphor as a vehicle to discuss issues and problems. 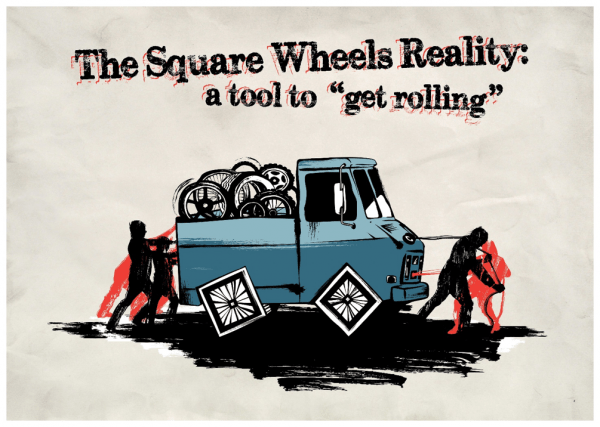 Simply talking about their perceived Square Wheels will generate many Round Wheel solutions to make things roll more better faster. Tons of research show that workers want to make improvements and will work on teams to look at the ideas for improvement and offer ideas and energy for implementation. They simply need the collective thinking and support of their workgroup to really understand the issues more clearly and to better define some solutions. So, it is about choice. Your choice to to continue to do things the same way or to actively involve and engage your people to interactively consider things from different perspectives and defining some issues and refining some ideas for workplace improvement. 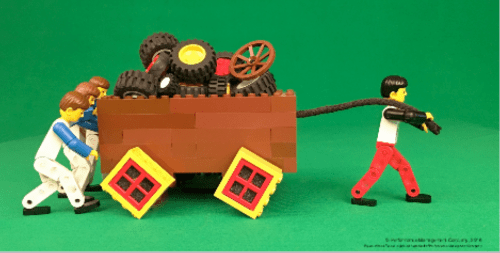 This kind of interactive discussion can be held at the front-line worker level or even among the top management team, although workplace realities would suggest that the people pushing the wagon know a lot more about the realities and problems than the wagon pullers. So, with that perception about how things really work, you can use your imagination to guess at what might be done differently. You can choose to be a Draggin’ Slayer on Spring Forward Monday® or continue to let things thump and bump. You can choose to improve involvement and engagement by involving and engaging your people in a new vision of how things can roll to the goal. If we have gotten you interested, here are some simple resources. One is a 2-minute video overview of the whole idea that we produced for 2017. We are continually working hard to make this simple tool available directly to supervisors and managers who need simple and effective tools for motivating their people. Doing this on Spring Forward Monday™ would be a nice touch, but doing one of these sessions any time would be of high impact and benefit. Note that this is a rewrite of the article on SFM that we published in 2017. If anything, there are even more research showing that the idea of doing things differently will have multiple positive impacts on people and performance.